At the beginning of the epic siege of Sebastopol in 1854, Russian defenders blocked the entrance to the harbor by sinking several lines of older sailing ships at the mouth of the bay. One year later, as the Czar’s forces abandoned the town, the remainder of the Black Sea Fleet, along with a number of transports and merchant vessels, were also scuttled. All told, nearly a hundred ships carpeted the bottom of the bay when British, French and Turkish forces occupied the port. English engineers pronounced the job of raising the hulks an impossibility, and were content to let them rot–a slow process that would ensure the strategic port remained unusable for years to come. But the Russians had a plan, one that involved a young American who, only a few years before, had managed another salvage project deemed “impossible by human means” by “professional” European divers. 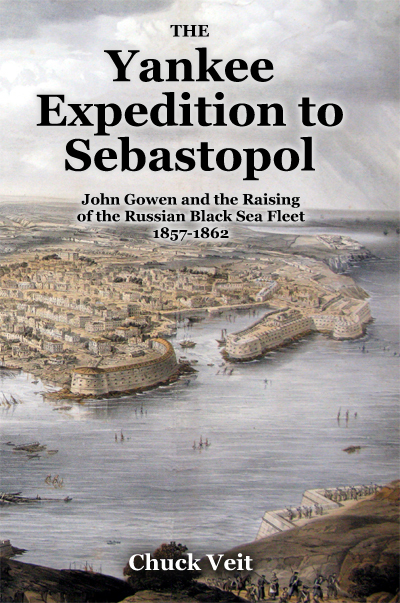 This is the never-before-told story of the five-year salvage of the Imperial Fleet from the Harbor of Sebastopol by John E. Gowen, a self-taught salvor from Lynn, Massachusetts, whose unique approach to technology, to dealing with the repeated “burstings and breakings” of the project, present an alternative to our own modern perceptions of progress and innovation.